After the L&NHS Convention in Hoover AL, we hung around the Bessemer and Birmingham area most of the day before heading north. The Atlantic Coast Line weaseled into the Birmingham industrial scene after taking over the Atlanta, Birmingham & Coast Ry. in 1946. The AB&C came into Bessemer through Reeders Gap, and then went northeast into Birmingham. In 1966 a connection was made with the L&N main line at Parkwood, and much of the ex-ACL west of there was abandoned in 1988. The NS main line to New Orleans (former Southern Ry. subsidiary Alabama Great Southern) is very active. 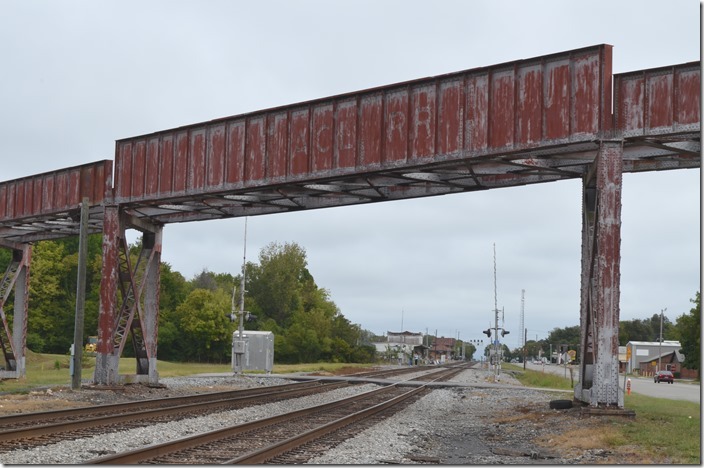 In the distance is the Bessemer Hall of History which is housed in the former Southern depot. 1. ex-ACL bridge Bessemer AL. 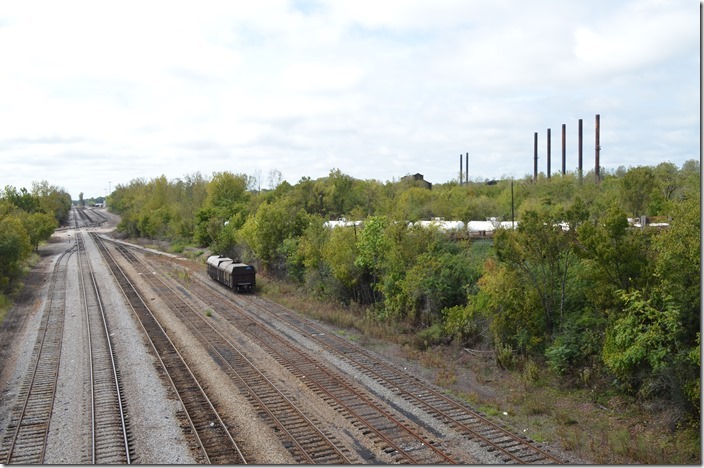 In the distance is the Bessemer Hall of History which is housed in the former Southern depot. 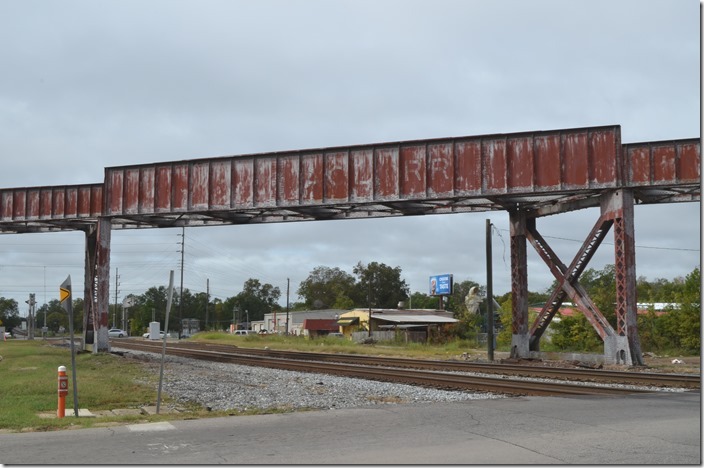 2. ex-ACL bridge Bessemer AL. Looking north. View 2. 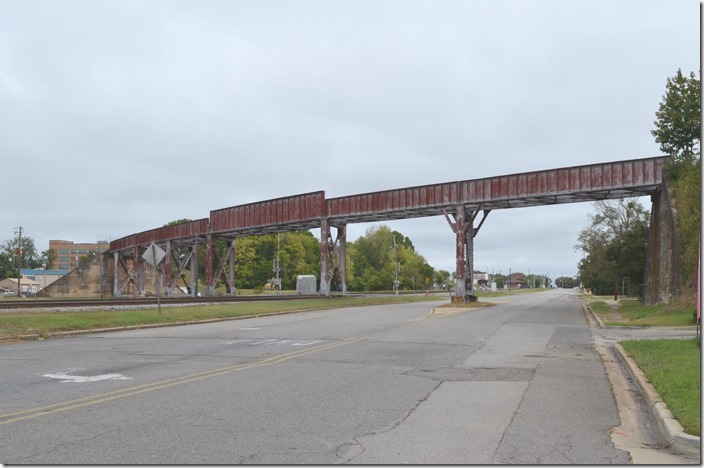 3. ex-ACL bridge Bessemer AL. View 3. 4. 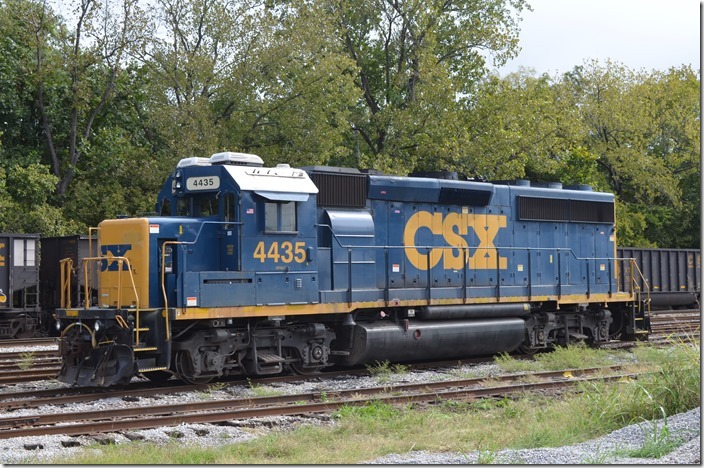 CSX GP40-2 4435 Bessemer AL. 5. 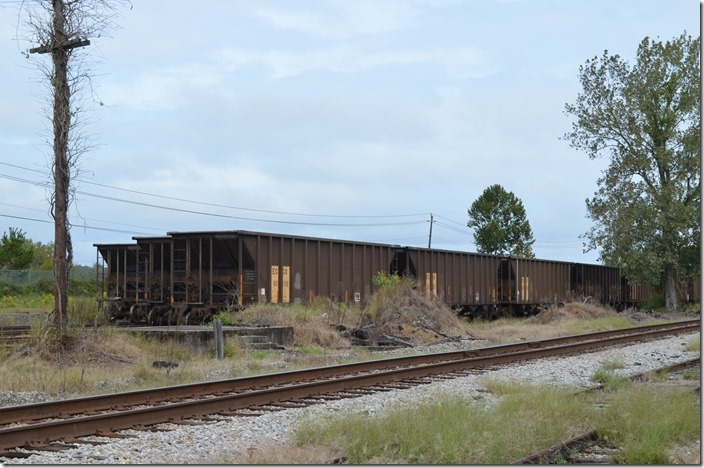 Former L&N Bessemer yard looking railroad north on the Birmingham Mineral SD. That is US 11 in the background. Blue Creek Jct. is behind me. We heard an air horn and took off looking for the source. 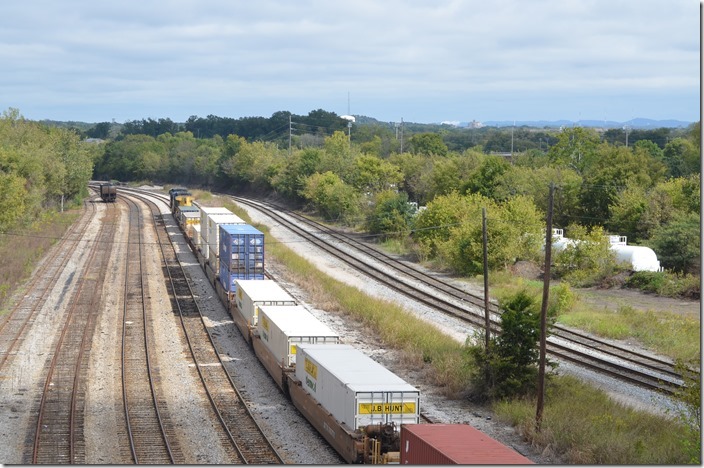 From US 11, I saw an intermodal train going north on the Birmingham Terminal Ry. (formerly U. S. Steel’s Birmingham Southern). 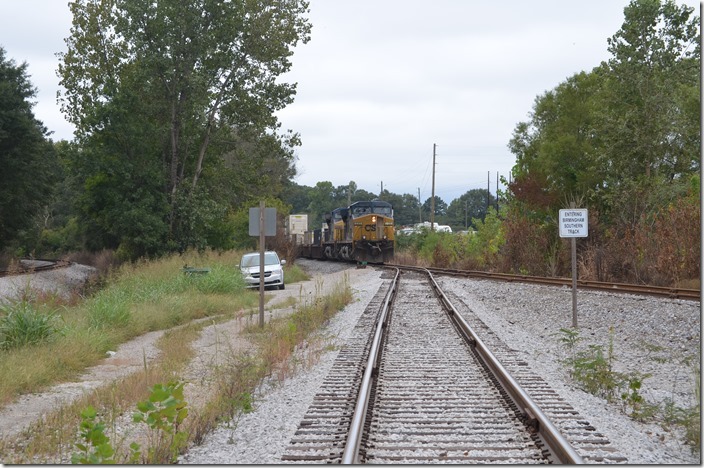 From the Davey Allison road crossing in Hueytown, we saw CSX 235-210. CSX 4435 Bessemer AL. View 2. 6. From Blue Creek the CSX Huntsville #1 SD goes north through Woodward, Fairfield and Ensley to Boyles Yard, north of Birmingham. 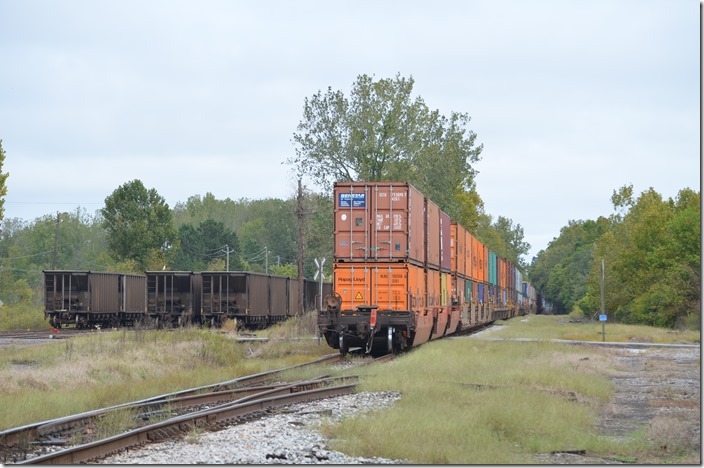 This intermodal train came out of the terminal at Bessemer which is located on the side of the old Trinity Industries (originally Pullman-Standard) freight car plant. My guess is that trains use the Huntsville #1 south to the site. From Bing it appears that the sidings are stub-ended with no convenient run-around. 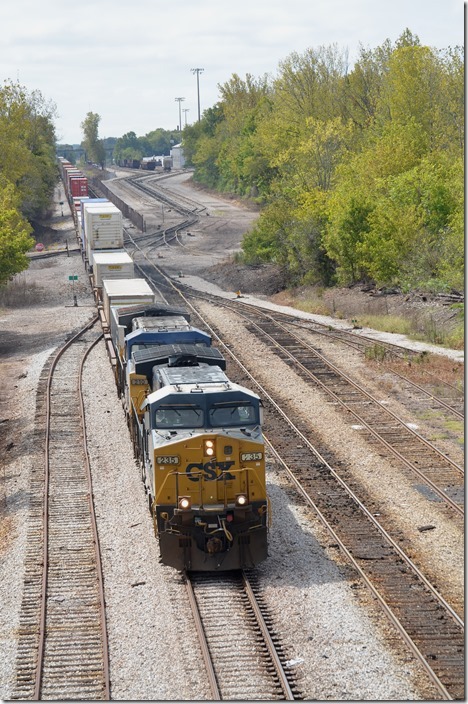 Therefore CSX uses BHRR coming out of Bessemer northbound. BHRR crosses the Huntsville #1 at grade. 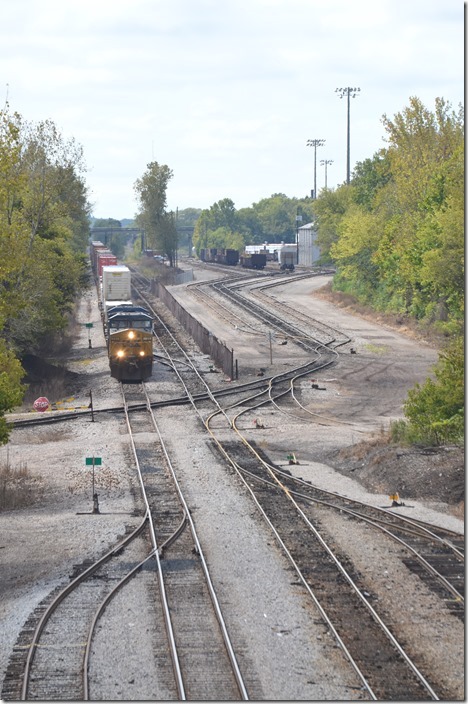 Then at MP OLB 402 there is this new connection between BHRR and CSX. CSX 235-210 Hueytown AL. 7. 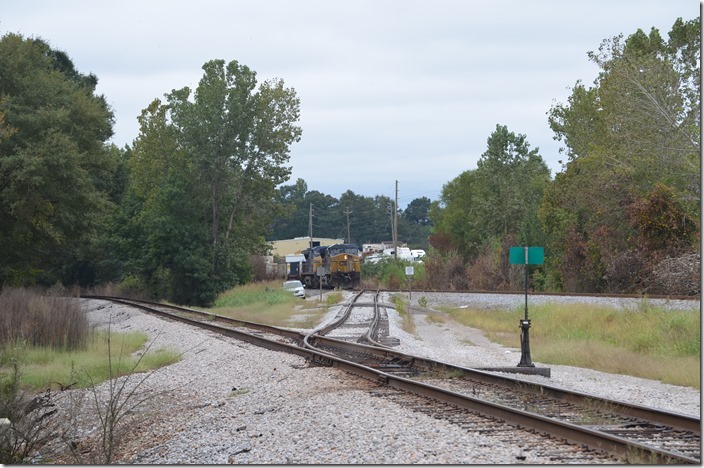 CSX 235-210 Hueytown AL. View 2. BHRR north of the junction switch appears rusty. 8. CSX 235-210 Hueytown AL. View 3. We left the location for a few minutes. Upon returning the double-stack was re-crewed and moving. 9. CSX 235-210 Woodward AL. We hustled up Woodward Rd., but he beat us to the crossing. 10. CSX 235-210 Woodward AL. View 2. This crossing was formerly Woodward Iron Company’s line from the blast furnaces to the coke plant and on west to the Mulga coal mine. 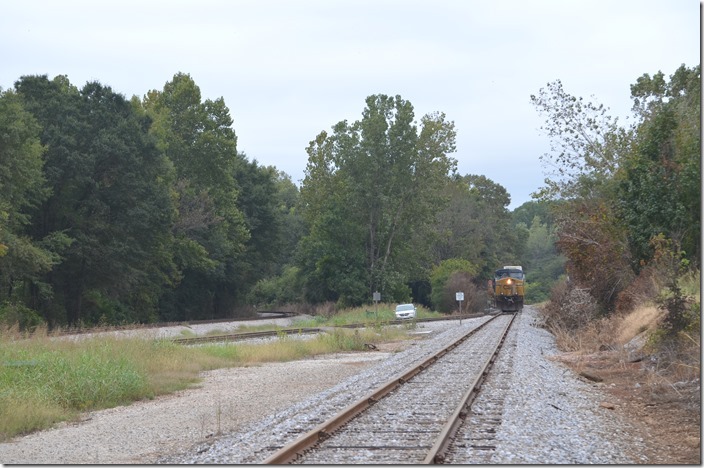 In 1997 Birmingham Southern was using this track to access the Koppers Coke Plant. The plant was closed in 1998 and demolished. 11. CSX 235-210 Woodward AL. View 3. Stored rapid-discharge hoppers are on the BHRR. I might add that Southern and Frisco also paralleled L&N up this valley which was the heart of Alabama’s steel and iron industry. It is unimaginable the activity that must have been here until the ‘70s. 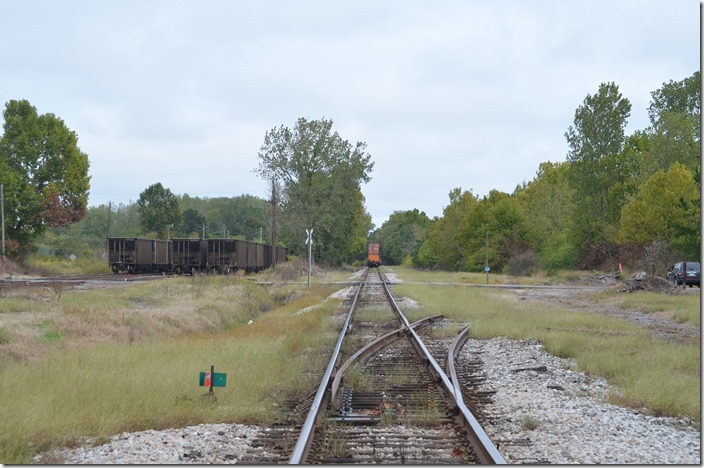 Alabama Railway Supply is to the right of my truck in a former Woodward Iron yard. It appears they deal in used railway track material. 12. CSX 235-210 Woodward AL. View 4. 13. 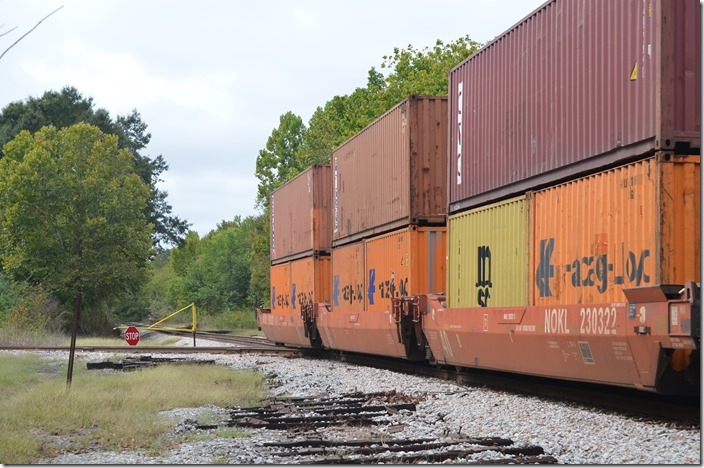 Alabama Power Col (ECGX) stored rapid-discharge hoppers at Woodward AL. BHRR yard Woodward AL. 14. 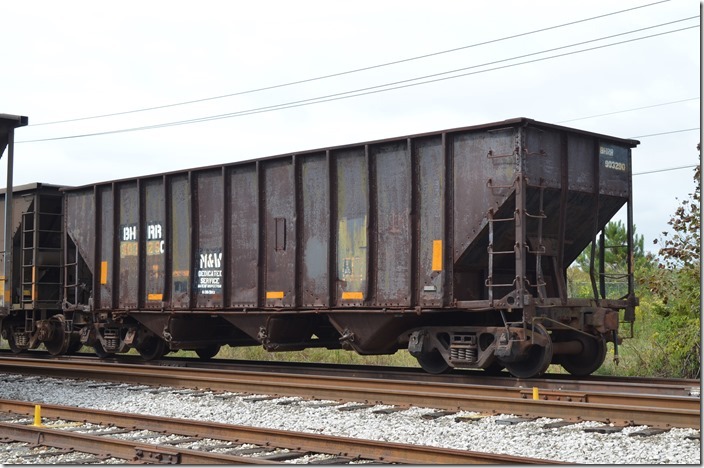 Revealing former U. S. Steel affiliation, this ex-BS hopper 903290 was built in 1936 and had “B&LE” trucks. This load limit was 154,000. BHRR hopper 903290 Woodward AL. 15. CSX 235-210 Ensley AL. Although the intermodal train was moving at the 10 MPH limit, we hustled ahead to Ensley to find a suitable photo location. The headlight is in the distance. 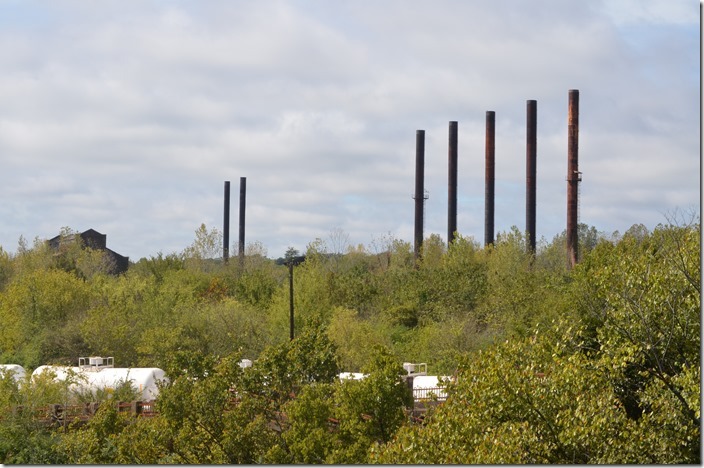 On the right are all that remain of the once sprawling Ensley works of Tennessee Coal & Iron (USS). The mill closed in the 1980s. Birmingham Terminal’s yard and engine terminal are in the distance. 16. U S Steel mill Ensley AL. 17. CSX 235-210 Ensley AL. 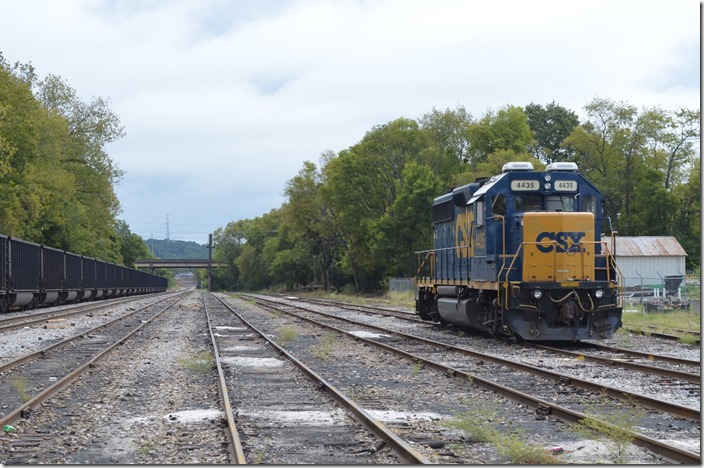 BHRR crosses CSX here to reach NS. 18. CSX 235-210 Ensley AL. View 2. 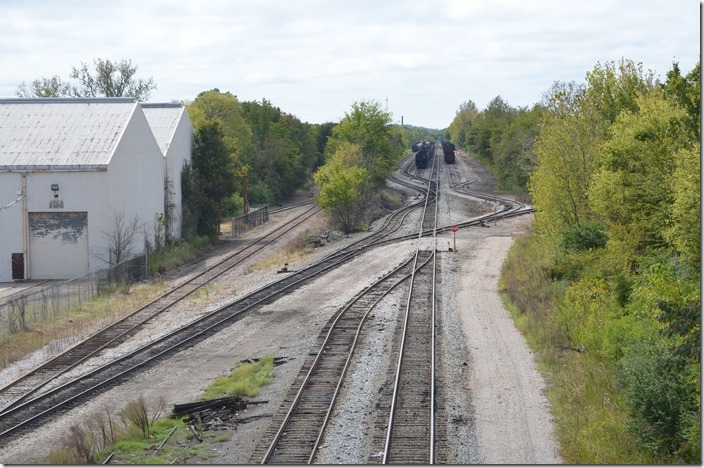 So from serving heavy industry, the Huntsville #1 SD now sees double stack trains! 19. 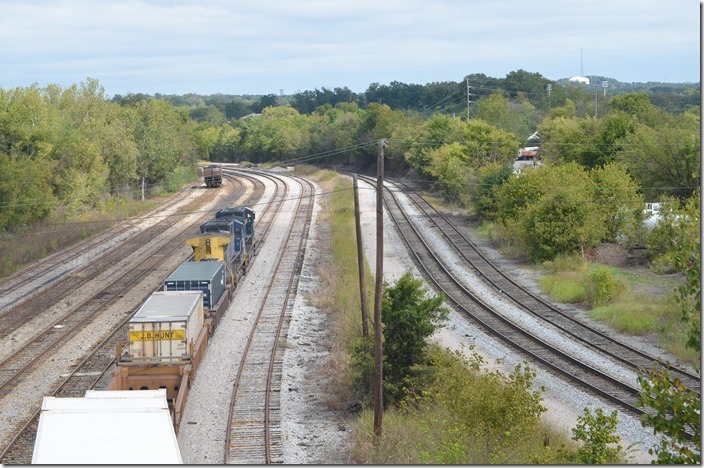 CSX 235-210 Ensley AL. View 3. NS and BHRR are probably the tracks on the right. 20. 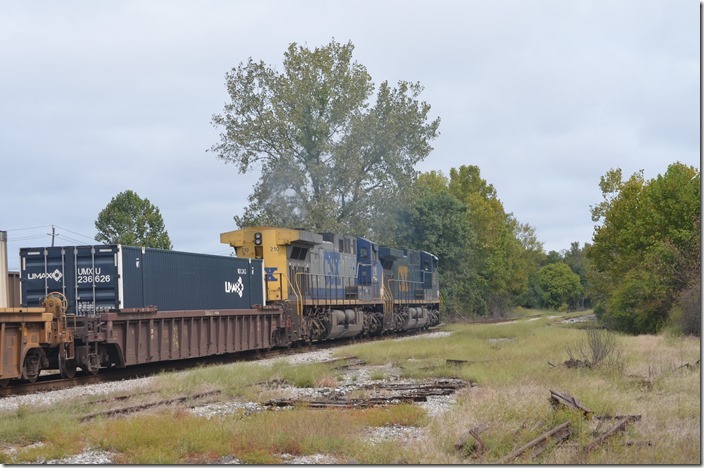 CSX 235-210 Ensley AL. View 4. Downtown Birmingham is in the distant right. 21. Looking south again, the BHRR cuts across the NS from the right to left. No automatic interlockings around here...stop signs and gates. BHRR NS interchange Ensley AL. After visiting the 16th St. Baptist Church and the Kelly Ingram Park, both infamous sites in Birmingham’s Civil Rights history, we headed back down to Bessemer. More on that later.